This blog is Laurie's spot to ramble on about anything and everything, but mostly about things that guests to the condo might want to know, and musings about her beloved Playa del Carmen, Mexico. 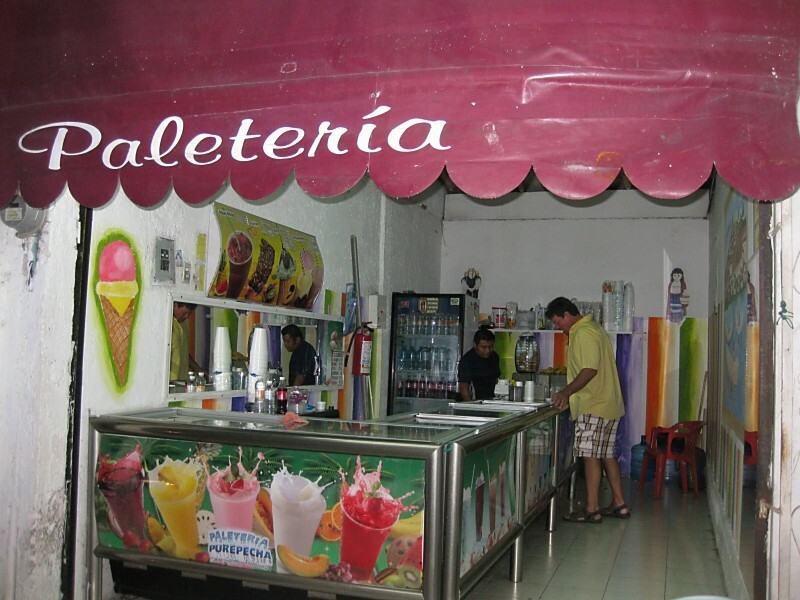 As Playa del Carmen has attracted more and more visitors to its beautiful beaches, we occasionally find ourselves searching for quieter options a bit down the road. Here are three spots that we recently visited to help you get started on planning a similar visit. We recently discovered the snorkeling in Puerto Morelos and it is now one of our favorite day trips outside of Playa. 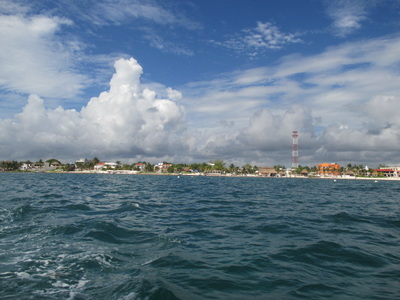 Puerto Morelos is located about 25 minutes' drive north of Playa. 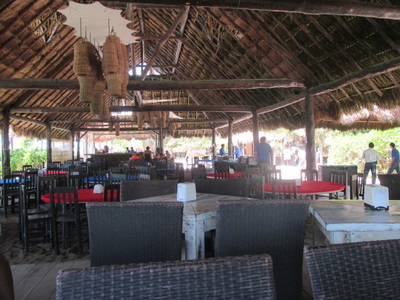 It's a small fishing village with a number of great, casual restaurants and a laid back vibe. It's easy to DIY by jumping on a colectivo or ADO bus (there are instructions for using the colectivos in the binder in the condo). Either option will drop you off on the highway, and taxis are easy to catch to take you to the water and town (about $5 USD). The taxi will drop you off at the pier and you will immediately have vendors offering to show you around or sell you a snorkeling trip on their boat. You will also see small shops and restaurants at this point if you are hungry. 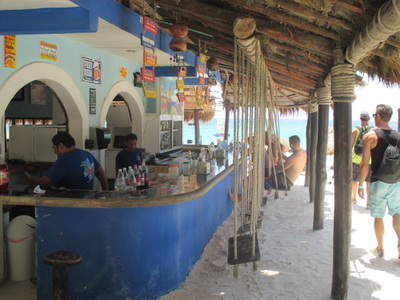 We normally take off and wander down the beach to the north of the pier, talking with various beach vendors along the way until we decide where we want to stop and spend the day. You will most likely want to visit with several different vendors before selecting a snorkel boat, comparing prices and amenities. 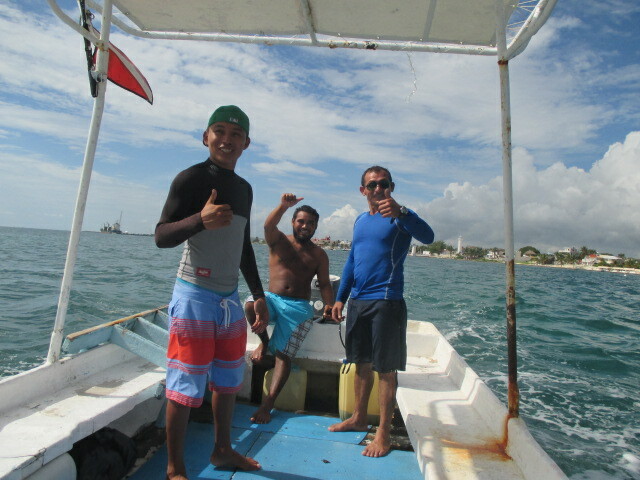 We have recently paid about $20 USD per person for a boat to take us to the reef and make two, 40 minute snorkeling stops with a guide. Be sure and verify that this includes the fee to visit the national park, as the reef here is protected, and it will normally include snorkel equipment as well. 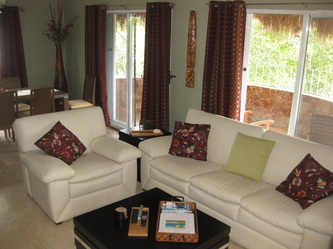 You will take about a 10 minute boat ride to the reef while you gear up and get ready to snorkel. The snorkeling here is quite good, with gorgeous, colorful coral and a wide variety of fish. The guides know where the fish hang out and will insist that you stay with them. This is for your safety as well as a requirement of the park. The current can be a bit tough in some places if it is really windy, so pay attention to the weather on the day of your trip, especially if you have newbie snorkelers as a part of your group. 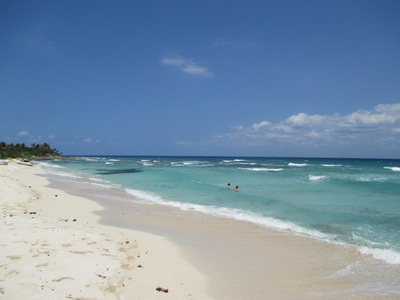 ​There is also a decent (so-so) place to snorkel from the beach without hiring a boat. The water is really deep, so be sure you are comfortable with that and bring your own equipment. The spot to snorkel is roped off so that boats do not enter the water there - it is located just past the street Lopez Mateos, about 7-10 minutes walk north from the pier. In the middle of the roped off area, there is a small vent where lagoon water mixes with the ocean water - you will see lots of fish hanging around this area, as well as around other rocks and small coral formations in the area. ​Although most of the beach clubs along the beach will offer you food, the best food can be found "in town" in the town square where you were dropped off, or along the street one block from the beach. 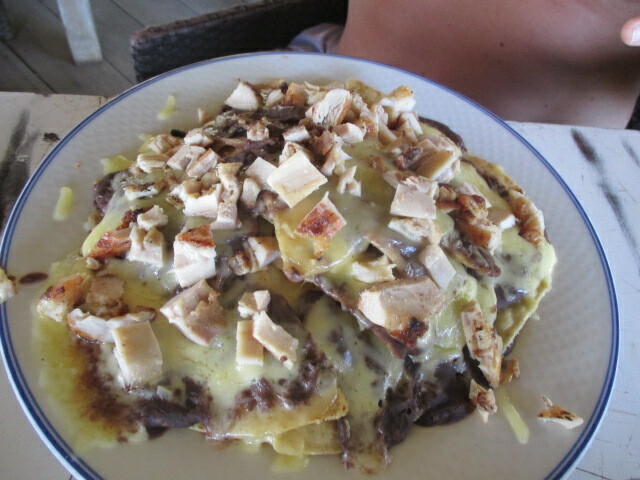 Next time we will probably eat first, then snorkel and relax on the beach. This fun beach is located in the other direction, about 20 minutes south of Playa del Carmen, just a bit south of Puerto Aventuras. 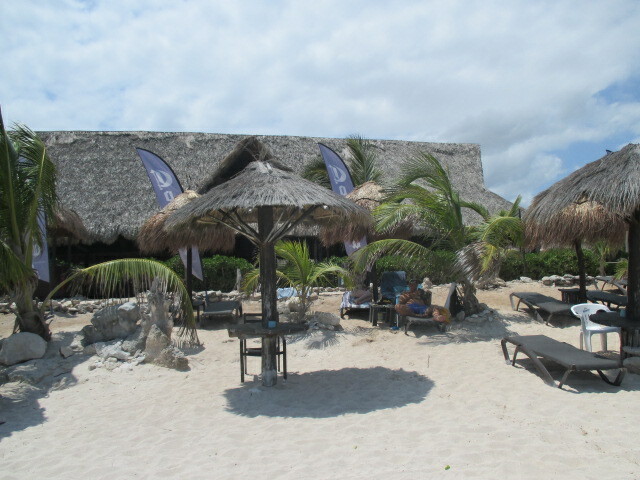 The beach club, La Playa, is a great place to hang out for the day. We took a cab on our first visit, but think we could use a colectivo next time. It is a bit of a walk from the highway where the colectivos let you off, but nothing too tiring. The entrance fee is $40 pesos per person, but this is refunded when you leave if you spend about $200 pesos per person at the beach club and present a receipt. 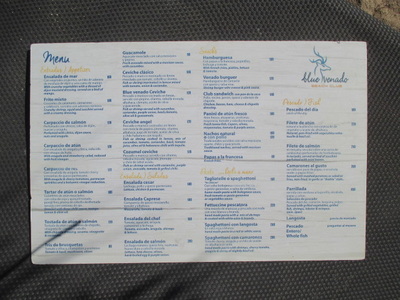 We found the food here to be really good, and the prices equivalent to, or better than, those at our favorite Playa del Carmen beach club, WahWah's. 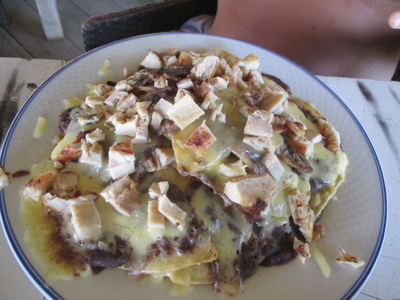 They have a very large selection of options from nachos to seafood and hamburgers. 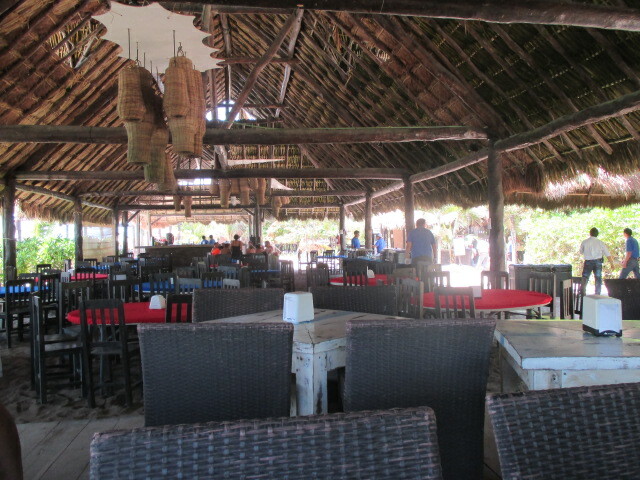 Although things are always subject to change, our group of 6 took over a large, permanent palapa for shade with a plastic table and 6 chairs at no charge. 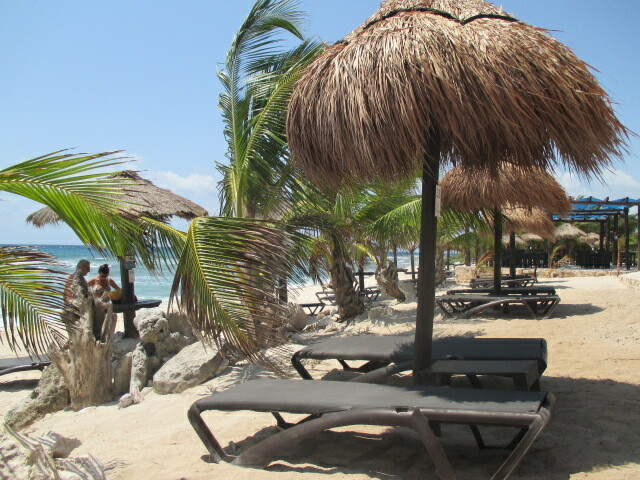 There were some loungers under umbrellas available for a small additional charge, but we didn't use them. We were happy at the table for the day. 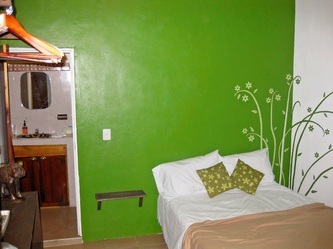 They also offer showers in their nice bathrooms, and plenty of space to rinse off and change clothes. Very laid back vibe and great service. I know we'll be back here again. 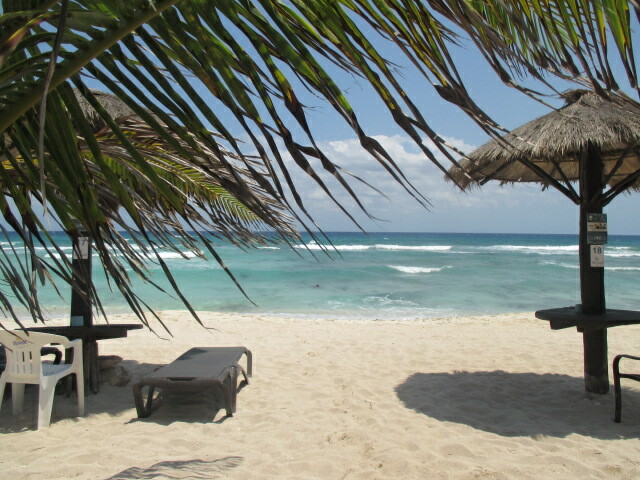 ​This beach club is located 8 kilometers north of Playa del Carmen and is one of the most picturesque and beautiful places we have spent the day. But it is a bit harder to DIY. The road from the highway to the beach club is quite long and very bumpy - we were really glad that we hired a taxi for the trip. We actually talked to several taxi drivers the day before we wanted to go and found someone to take us round trip for $400 pesos. We just gave him the time to pick us up at the end of the day and he was waiting for us. This beach club offers a lot of activities in addition to just eating and relaxing on the beach - snorkeling tours, ATV rides, horseback riding, etc. You might want to visit their website here ahead of time to check them out. Their website is geared towards guests staying at hotels in the area, offering tours and activities as well as transportation. If you purchase one of their tours (reasonably priced to us), they will pick you up at the condo for just $10 USD per person. We just wanted a beautiful place to hang out and read for the day, so we cannot speak to any of the tours, but everyone we saw looked like they were having a great time. 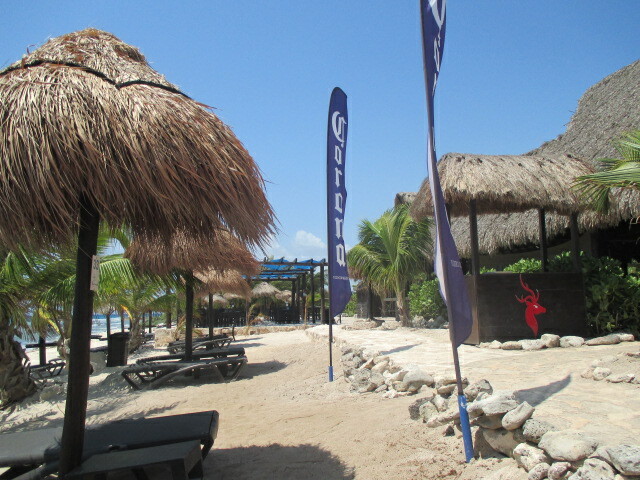 This is an upscale beach club without the upscale price - everything was gorgeous and very well done. They do lots of weddings here which isn't hard to believe once you see the incredible beach and view. Extremely clean and quiet, even though there were tours being offered. The food was very good and the prices similar to WahWah's, along with very good service. 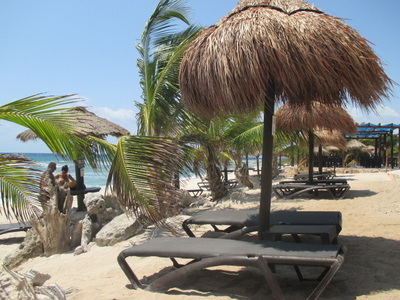 Since we didn't do any tours, we enjoyed a palapa and 2 lounge chairs for free, but paid $100 pesos for our third lounge chair. In January of 2010, Mark and I decided to do an overnight trip from Playa del Carmen in order to see some of the ruins. This was a great way to experience the ruins, as well as some of the other sights along the way. We decided to rent a car for the trip, which we normally don't like to do. We prefer to let others negotiate the crazy Mexican traffic for us. But this gave us the most flexibility, which we needed in order to do everything that we wanted to do. The best tool we had to plan our trip was the Mayan Aventures map set from Mapchick maps. These are the best guides to the area that you will ever find - we can't live without them. And we certainly wouldn't have set off on our own on this trip without their expertise. We decided to visit the ruins of Coba and Ek Balam, even though we have not yet visited the grandaddy of them all, Chichen Itza. 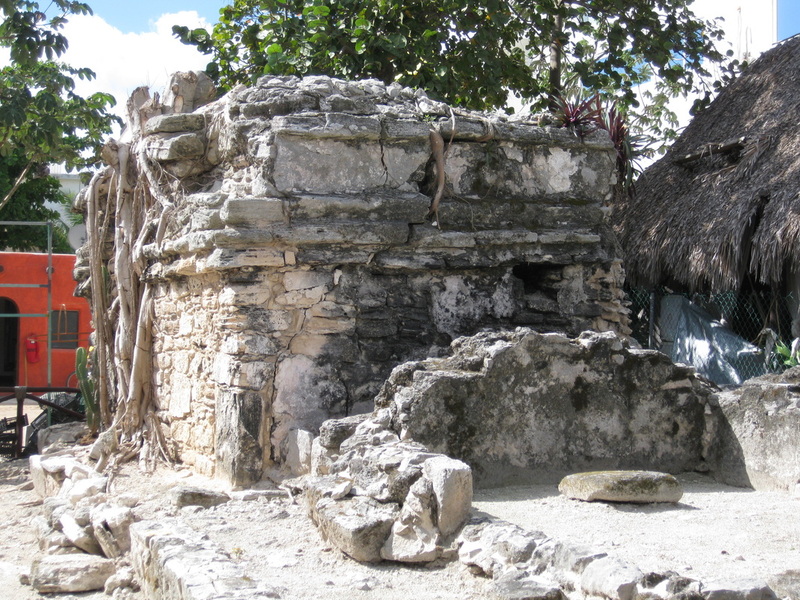 You can still climb the great pyramids at Coba and Ek Balam, but who knows for how long? So we thought it would be best to visit these now. CI isn't likely to change much over the next few years so we can always visit there. This turned out to be a great decision. We started out by spending the night in Tulum the night before our adventure started, just to be sure that we were early to the ruins the next morning. 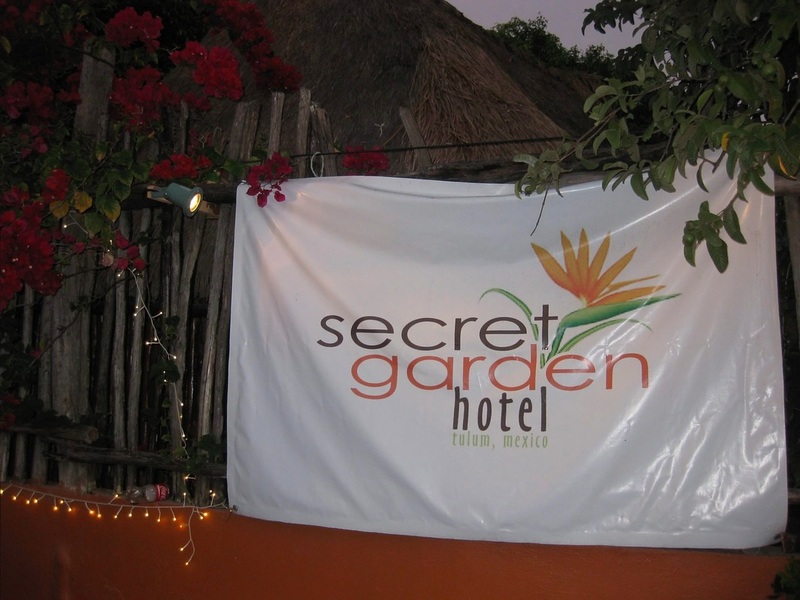 We found a charming boutique hotel in Tulum that we absolutely recommend, the Secret Garden Hotel! 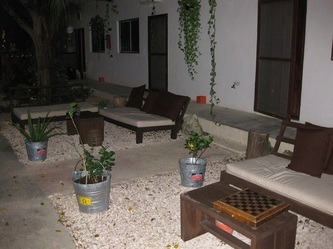 It was only $20usd per night with lovely owners. It was new and this was indeed a bargain. 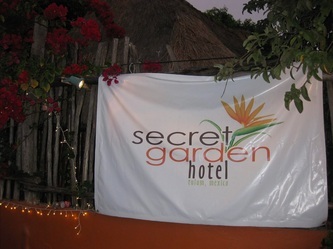 Their prices are up some from 2010, but this is still a charming and great value hotel for a night or two in Tulum. 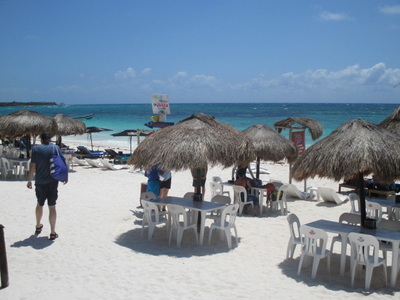 Many of our guests ask about things they can do in Playa for not a lot of money. One of our favorite things about Playa is the diversity of experiences that can be had. Playa boasts an abundance of fine dining establishments, as well as wonderful, moderately priced restaurants and some that are downright cheap! And all of them providing excellent food. In addition to diversity of meal choices, you can also choose whether to have a quiet, relaxing vacation or you can have an adventure-filled trip - all at the same destination. 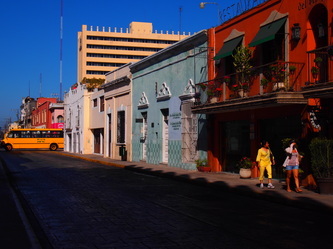 One can also choose whether to walk a couple of blocks to experience the warm, Mexican culture or spend your time hanging with the tourists speaking nothing but English. We love having so many options available on how to spend our time. Use local transportation. It's not difficult to learn, and we love helping our guests get the most of this option. Taking taxis everywhere or renting a car for a whole week can really eat into your cash. If you want to go exploring, just rent a car in Playa for the day or two instead of for your whole trip. 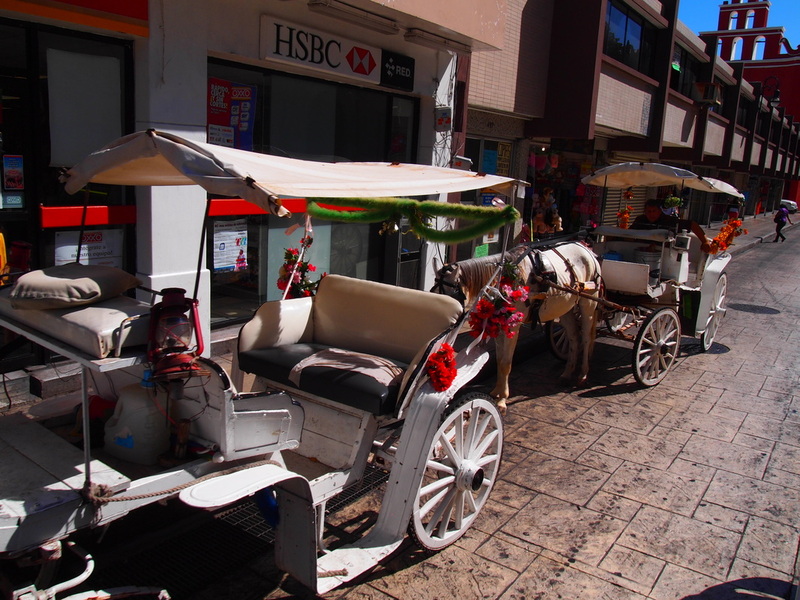 For us, traveling like the locals do includes taking the bus from the airport to Playa instead of a shuttle (if the total number in our party is 4 or less). The ADO bus station is a short walk from our condo and can take you to destinations up and down the coastline as well as inland to popular ruins and colonial cities, for little more than a song. And the colectivo system is hard to beat for getting up and down the coastline inexpensively and on your own time schedule. The bonus is you get to experience true local flavor. Visit the grocery store upon your arrival and stock up on adult beverages, snacks and items to make a few meals in the condo. You'll be glad you did. When eating out, don't be afraid to venture away from 5th Avenue. 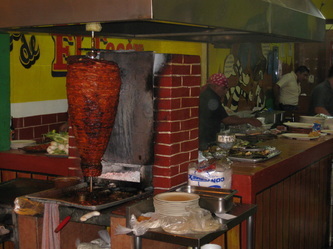 Just a few short blocks "inland" and you will find some of the best local restaurants at very inexpensive prices. Ask us - we'll be happy to give you some specific suggestions. 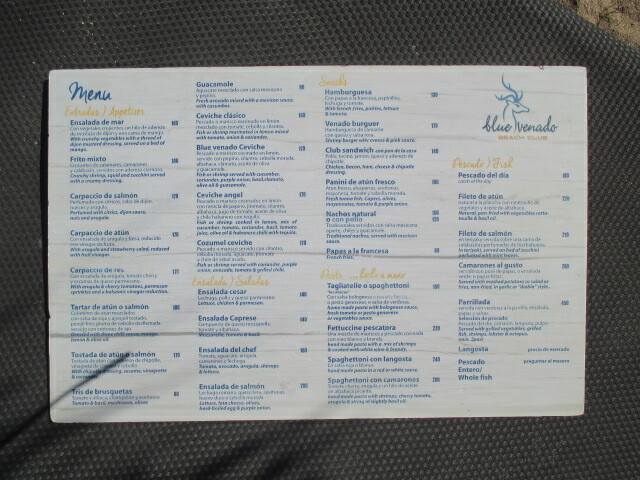 There is a Mexican food glossary in our condo that will help you navigate the menus in Spanish. 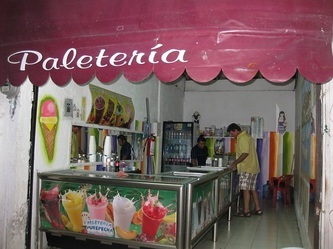 Skip the ice cream spots on 5th Avenue and opt for Mexican ice cream on 10th or Juarez - there are lots of them. Instead of paying $10US for a scoop of Haagan Daaz, you'll pay about $1-2US and experience some new flavors at the same time. Slow down. Really. This is Mexico, where life should be lived to the fullest! Don't feel that you need to plan out every day. Save time to explore the area at a slow pace and be aware of the beautiful scenery around you. Spend a day at the pool (WalMart has lots of pool toys) instead of forking out cash every day for another eco-park. They can be really fun, but pricey. Our pool is pretty cool and with sandwich makings upstairs, it's a really inexpensive day. How about some specific suggestions on inexpensive activities? 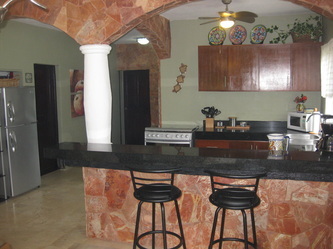 Ride bikes around the Playacar neighborhood - there are lots of beautiful homes to see. (We supply 2 bikes in our condo). Just be careful and watch for pedestrians and other bikers! Visit a cenote - there are a couple that are close to Playa and easy to get to using the colectivos. They have very inexpensive entrance prices ($5-10US) and are a great way to experience something unique to the area. Pack a lunch and make it an even more affordable way to spend a day. People watch. For the price of a cervesa on 5th Avenue or at the beach - you will be surprised at how entertaining our species can be, and how varied! We love hanging at the outdoor cafes. 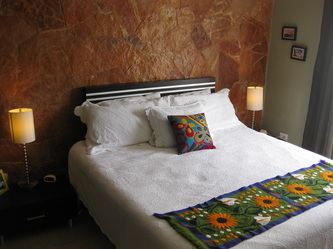 Also on or around 5th Avenue - pop into some of the charming boutique hotels and wander around. We've never seen such beautiful and totally unique properties anywhere else we have traveled. The various pools and courtyards are really worth seeing, and the architecture, too. We've never had anyone object to this, and many have offered to show us a room which is fun. Some to try - Kinbe, Luna Blue, Deseo, Hacienda del Caribe, Moskito Blue, but the list is almost infinite. 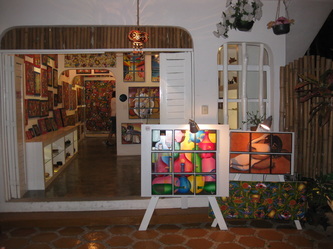 Watch the calendar at Buy Playa for local activities going on - especially the art walks. Often on Tuesday and Thursday evenings you can see local artisans showing their work on or close to 5th. 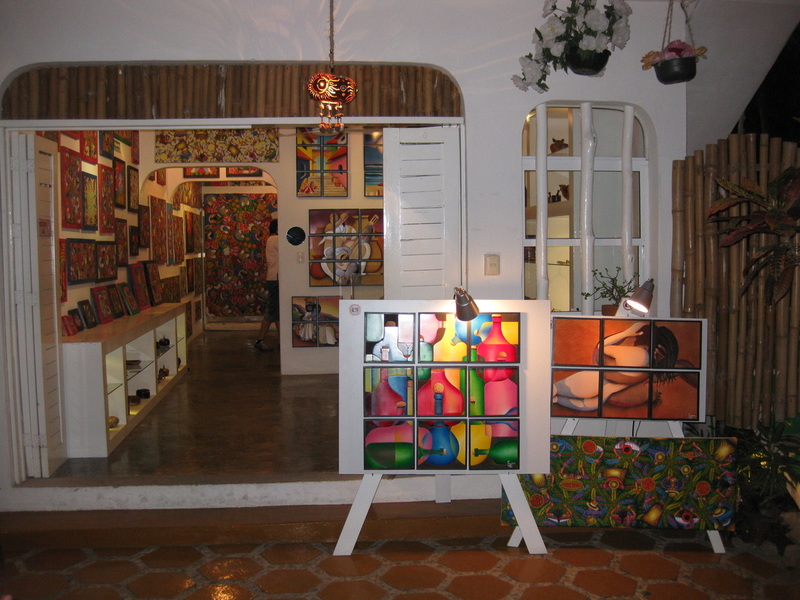 And at any time you can duck into the Casa Mediterranea (between Calle 6 & 8 on 5th Avenue) and explore their galleries and boutique shops with local work. There are a couple of other small galleries up and down 5th - check them out. One of the local activities that is fun (and free) is to volunteer at a charity event or activity. Coco's Cat Rescue is one of our favorites. Every Friday afternoon you can play with rescued kittens, getting them used to people and ready to be adopted. Be careful, though, you might fall in love with a couple of them yourself! Lots of local clubs have live music and wonderful bands for you to enjoy, just watch what you spend on drinks or this can work against you. Some of the most popular joints are WahWah's, Bad Boys, Luna Blue and Kixte. 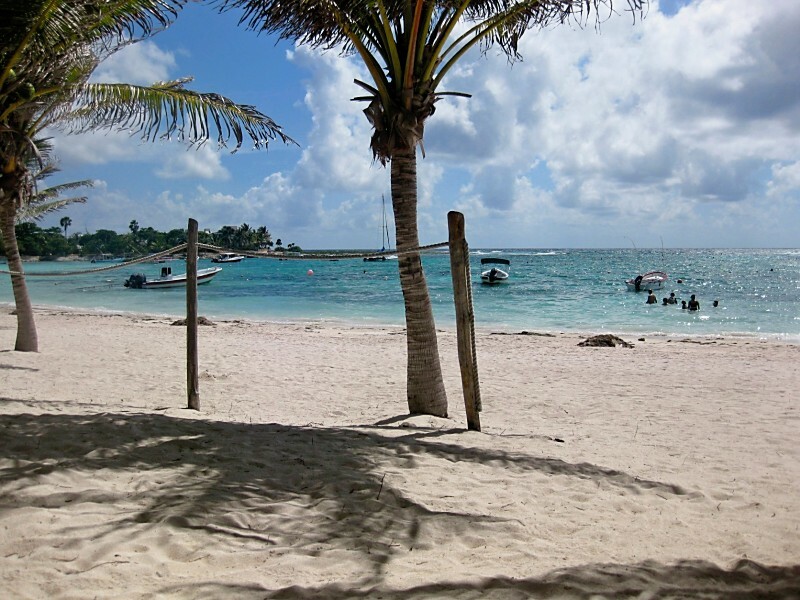 Spend a day at Akumal swimming with the turtles. Akumal is about 30 minutes south of Playa and is accessible by colectivo for a song. Once there, if you have your own snorkel gear, it's just a matter of laying down your beach towel and getting in the water. There are dive shops there that will rent you snorkel gear pretty inexpensively for the entire day, for the cost of one snorkel excursion that may only last a few hours. Eat lunch at the Economica lunch counter near the convenience store just outside the arches. See more info in our Things to Do tab. You can even check out a few small ruins for free without leaving town. Although certainly nothing like the magnificent pyramids outside of town, there are some interesting ones throughout Playa that are fun to see. One is just around the first corner (headed west) from the condo. Another is immediately out the back door of WahWah's beach club. We like the ones that are at the end of the path through the wooded area in Playacar (take the path by the guard gate headed to the beach). 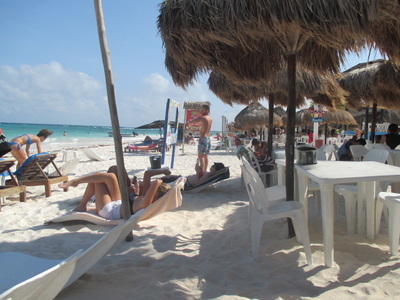 What are your favorite ways to enjoy Playa del Carmen inexpensively? One of our favorite repeat guests, Lori M., was nice enough to tell us about their recent trip to Merida while staying a few weeks in our condo. I thought everyone would enjoy seeing it - this is a great way to spend a few days outside of Playa when you are visiting for more than a week and have some time to explore. Lori has done all the homework for you and has some wonderful tips to share. Enjoy! While visiting our favorite condo in the entire world, Casa de Sueno at the Rosa Blanca condominium complex in wonderful Playa del Carmen, Mexico, we decided to take a “trip within a trip" to the capital of the Yucatan Peninsula, the city of Merida! Merida is rich in history, culture and art. 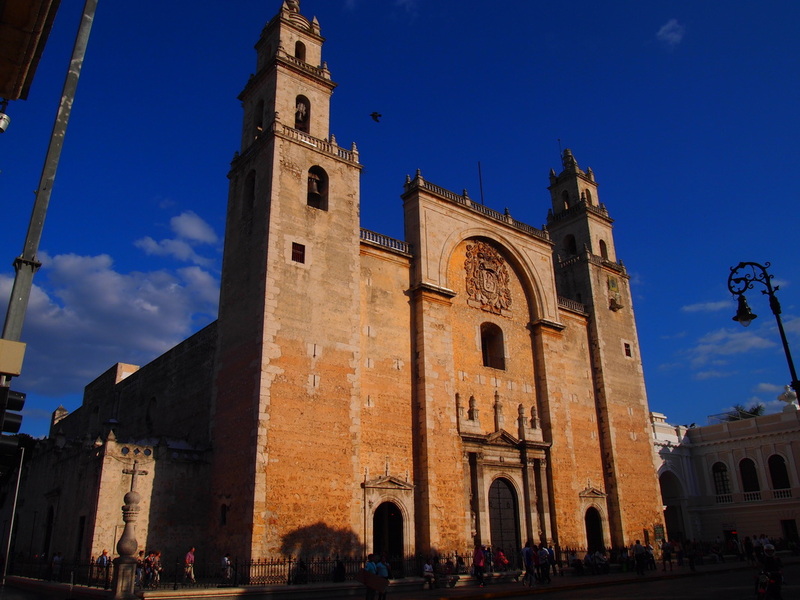 From the many exquisite churches to the historical palaces and homes of very influential members of Mexican and Mayan history...Merida has it all! 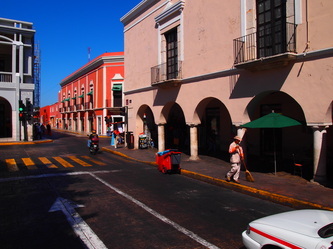 The city of Merida boasts a population of well over 800,000 people. With both car and foot traffic, the city is bustling 24/7. This factor sets Merida apart from the quiet atmosphere offered by Playa del Carmen…. 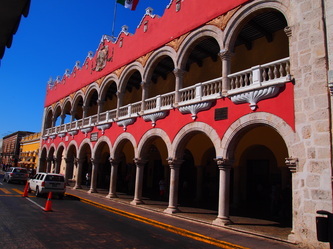 Merida was once the stronghold of Spanish colonialism in the Yucatan Peninsula. You will find restaurants, museums and markets along with beautiful mansions, churches and buildings that recall the city's peak of success as the wealthiest capital in all of Mexico. The city is full of colourful streets! 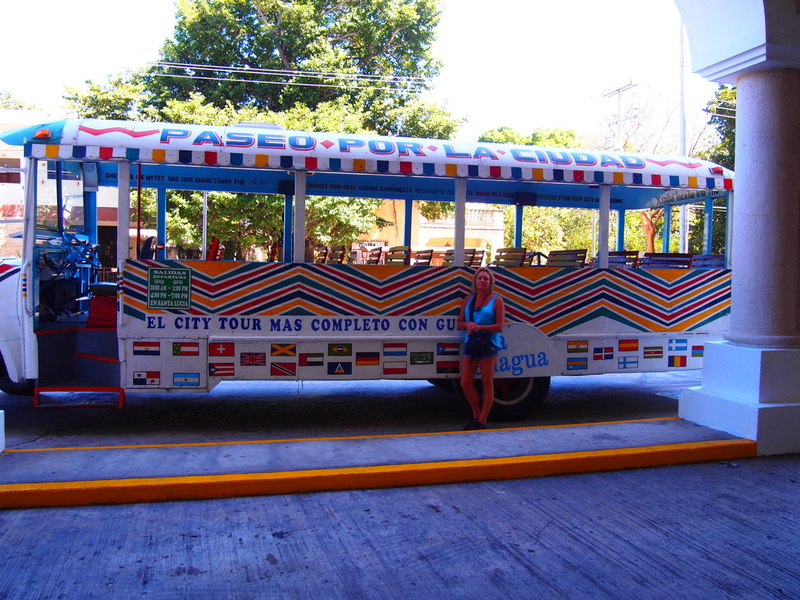 The easiest way to get around Mexico is the ADO bus! Although there was a lot of apprehension about using the bus, it turned out to be a very pleasant experience. 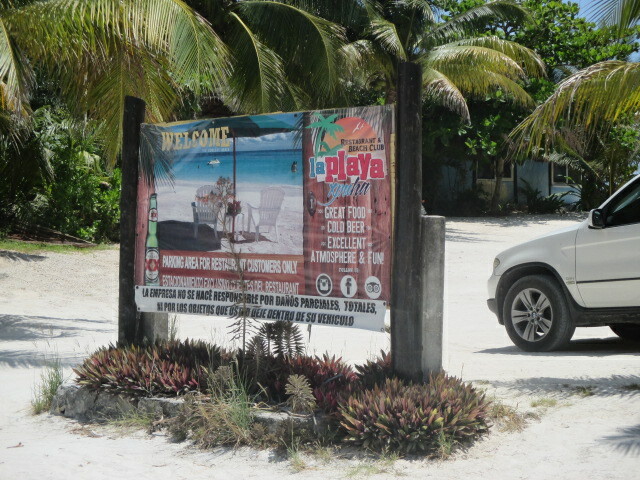 The ADO schedule from Playa to Merida can be access at www.ado.com.mx. 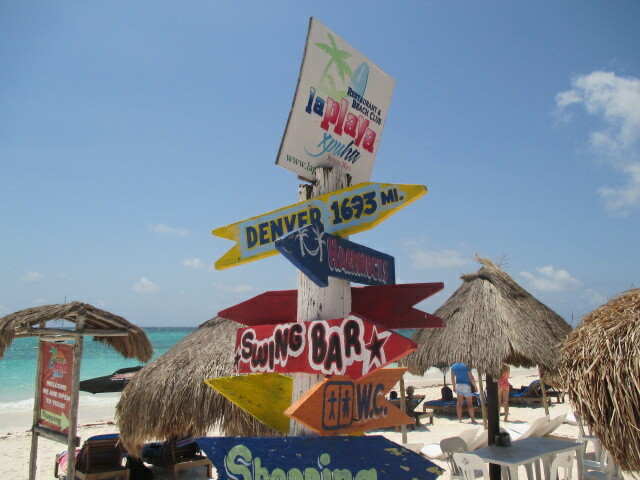 Please note that this site will provide you with a general idea of the places and times the ADO runs to and from but the best thing to do is to go to the bus station on Juarez or 20th Avenue in Playa and look at the schedule posted on the board. Schedules change frequently apparently so be sure to verify your information at a bus station and do not rely on the website. There are two bus stations in Playa del Carmen. There is one downtown at the corner of Juarez and 5th Avenue. It is apparently called “Playa del Carmen Alterna, Qro”. The second station is located at 20th Avenue and Calle 12. It is apparently called “Playa del Carmen, Qroo”. These buses are well maintained “coaches” complete with bathrooms and air conditioning. 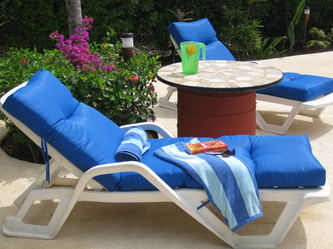 The high-backed, generously cushioned seats are very comfortable and clean. 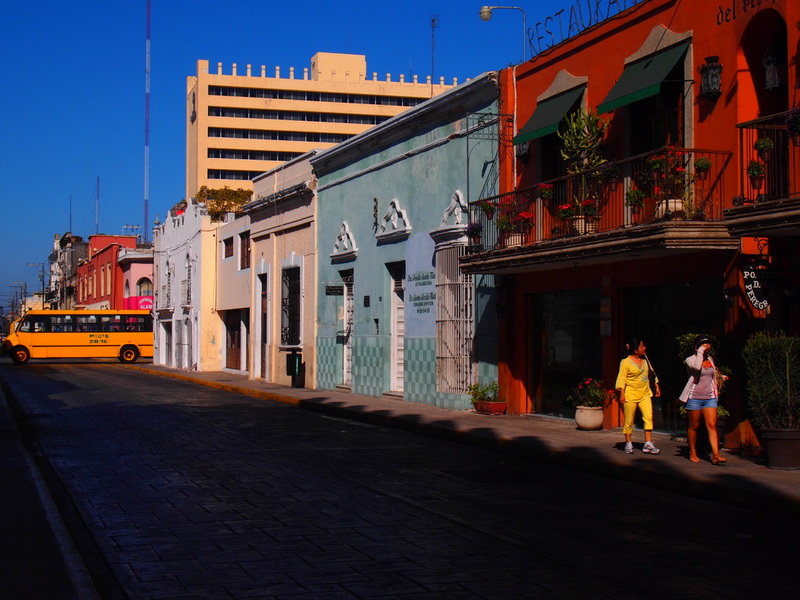 There are various levels of ADO buses with respect to comfort but all are great for travel around Mexico. As the “luxury” of the coach increases, so does the price! We took the lowest level coach and were very pleased. The cost for this level was $334 pesos per person one-way to Merida. The buses to Merida fill up quickly so be sure to purchase your tickets ahead of time. We planned to travel on the 18th but were advised to purchase early. We went to the station on Juarez on the 16th and the bus we wanted to take was already 80% full! On the day we travelled, the bus was completely booked. Here is another very important piece of information that you need to be aware of. We can thank the Playa Forum (www.playa.info/playa-del-carmen-forum) for assisting us with this….the bus to Merida departs from the 20th Ave station only! We misunderstood originally and were under the impression that we could purchase our tickets and depart from the Juarez station. This is not the case! Had we not been made aware of this critical piece of info prior to our trip, we would have been at the wrong place and missed our bus! You can purchase your tickets at either station but ensure you know which station your coach leaves from! 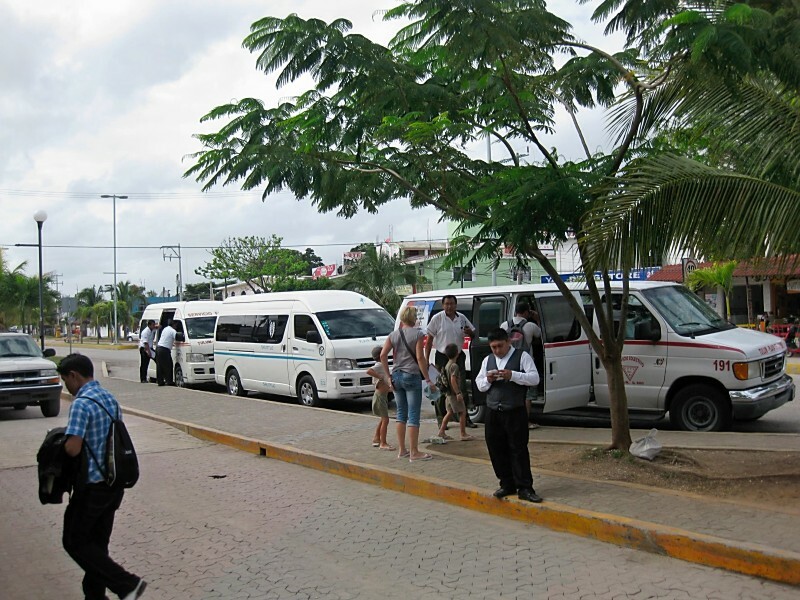 It is important that you understand that there are 3 bus stations in Merida. They are as follows: Merida, Yuc. CAME, Merida Fiesta Americana, Yuc., and Merida Altabrisa, Yuc. 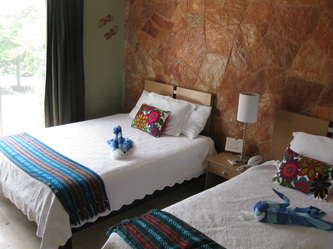 We chose to arrive at the Merida, Yuc. CAME station because it is right downtown, it was close to the Gran Hotel where we stayed and, most importantly, arriving at this station offered us the best choice of times to leave Playa! 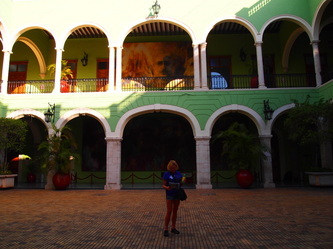 We chose to take the 10:30am coach that offered the quickest direct trip, 4 hours and 15 minutes, to Merida. The station you choose will depend on your circumstances! Once we arrived at the CAME station, we took a 5 minute taxi ride to the Gran Hotel. The day we departed, we asked the hotel staff to arrange for a taxi to pick us up and take us back to the CAME station. It was quick and easy! If you plan to use a taxi, write down the address you want to go to in Spanish if at all possible. The taxi drivers do not understand a lot of English, spoken or written. Ask the hotel staff to help you with this or…use Google Translate!! It was a great help to us! www.translate.google.com. One thing to remember, all the even number streets run one direction while the odd numbered streets run the other direction. 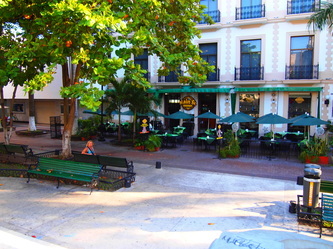 Ie: The Gran Hotel is on Calle 60 near the intersection of Calle 60 and Calle 59. All even numbers intersect with odd numbers. Ask your hotel staff if they have maps available to assist you. 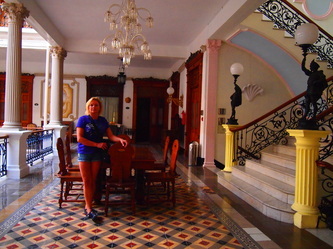 We stayed at the Gran Hotel, which is located on Parque Hidalgo. 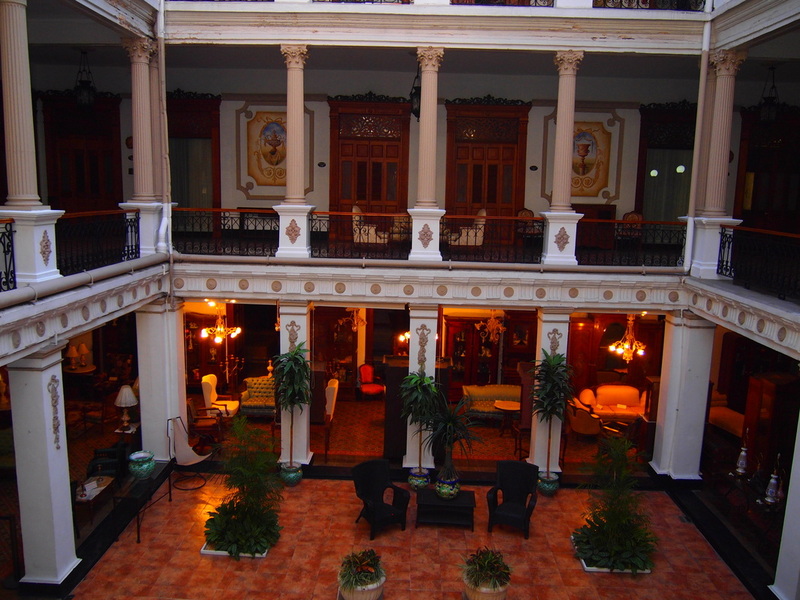 This legendary hotel was built in1901. 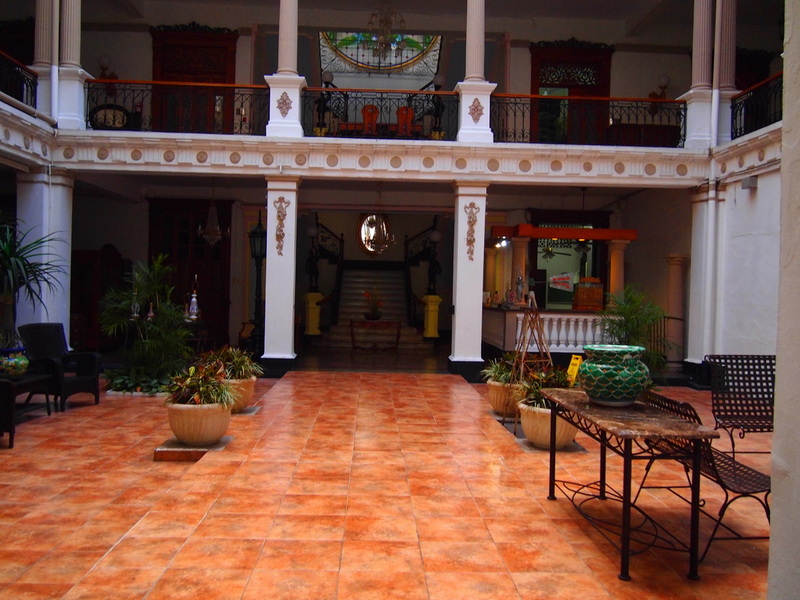 It boasts high ceilings and wrought iron balconies and ornately patterned tile floors. The decor is so classic you expect to see a Spanish Señorita appear and grace the grand staircase wearing a beautiful floor length gown. If you are a true history buff, this is the place for you! They have tried to keep things as original as possible! 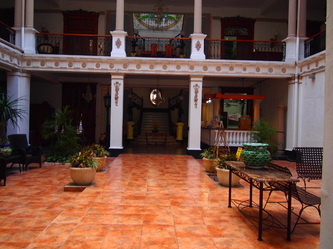 The hotel has undergone some renovations as recently as 2004. The Gran Hotel has WiFi and televisions. 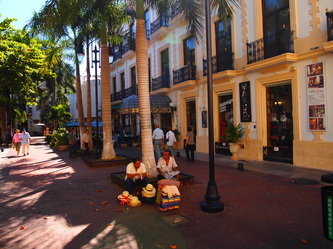 Since it is located right in the centre of town, it is right in the middle of all the hustle and bustle of Merida. It is close to everything you want to see and do. 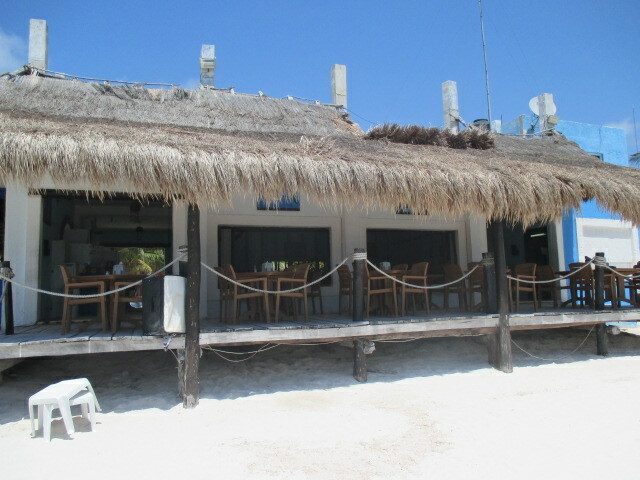 There is a restaurant on site that is operated independently. The food is very good and reasonably priced for a "tourist" city. The two nights we were there they had live entertainment that was absolutely awesome. Say “Hola” to Carlos for us if he is playing when you visit! There are no elevators in this hotel. If stairs are a concern, this may not be the right place to stay. All guest rooms are on the second and third floors. There is no pool at this hotel. We tried to call and reserve a room on our own but no one spoke English. It would be wise to have your concierge call and make inquiries for you and then make your reservations to ensure there are no misunderstandings. Try to get a confirmation number or an email stating that you are booked. We took a city tour with La Gua Gua Tours. There are many tours available but this company offered convenient times and the tour guide spoke both Spanish and English. Other tour companies only offer their services in Spanish. Be sure you find out what language your tour is offered in before you book anything! 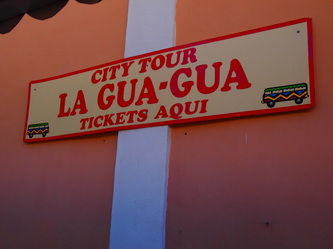 The La Gua Gua tour took just over 2 hours and covered a large portion of the city. The cost was very reasonable. Only $90 pesos per person for adults and $50 pesos per child! 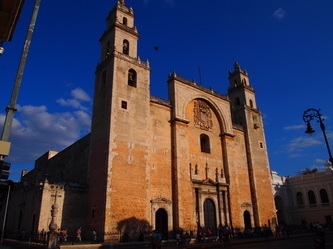 Cathedral de San Ildefonso. Apparently this beautiful church began in 1545 and is believed to be the oldest cathedral on the mainland in the Americas. Several hundred Mayan labourers worked with stones from the pyramids to create this church over a 36 year period. There are many items inside that warrant a visit! The church is only open for certain periods during the day. We went at 4pm on the day we arrived and were fortunate to meet a very interesting gentleman who was happy to show us around and explain the many wonders housed within this amazing cathedral. Be sure to visit with the “Cristo de las Ampollas” (Christ of the Blisters) and learn the history of this amazing statue. 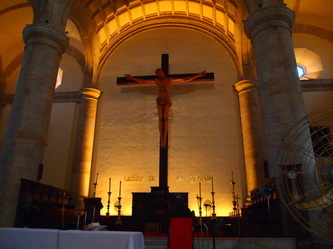 The enormous crucifix within the altar is the “Cristo de la Unidad” (Christ of Unity), a symbol of reconciliation between those of Spanish and Maya heritage. The carving is just over 7 meters or 23 feet long! 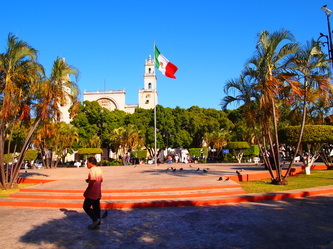 Independencia or the Plaza Principal. This spot even has free WiFi!! 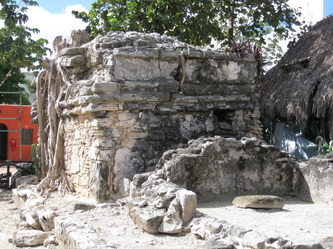 It was originally laid out in 1542 on the ruins of T'ho, the Mayan city demolished to make way for the city of Merida. 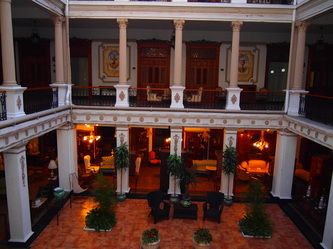 Gran Hotel. 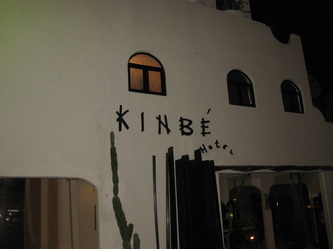 If you are not staying at this hotel, at least stop by and see it. It is beautifully kept and deserves a look. Refer to the pictures above! 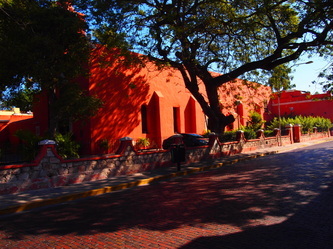 Government Palace. (Palacio de Gobierno) This structure was built in 1892 on the site of the palace of the colonial governors. On the walls there are murals painted by local artist Fernando Castro Pacheco. Completed in 1978, they were 25 years in the making and portray a symbolic history of the Maya and their interaction with the Spaniards. The structure is absolutely beautiful. There are many more points of interest to see in Merida but we had another adventure to take so that was all we were able to see in 1.5 days! We travelled back to Playa del Carmen with Mitch that evening in his tour van. It was a wonderful 3 day trip. We highly recommend it! Mexico has so much to see and do. 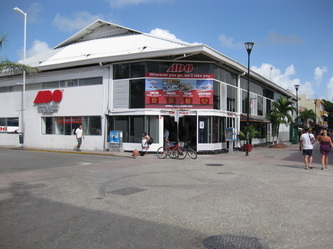 Do not hesitate to use the ADO bus. Plan your trips and go! Using the condo as your home base for all sorts of adventures is a perfect way to see all the magnificent sights in Mexico. We hope this story will encourage you to travel to Merida and other parts of Mexico! 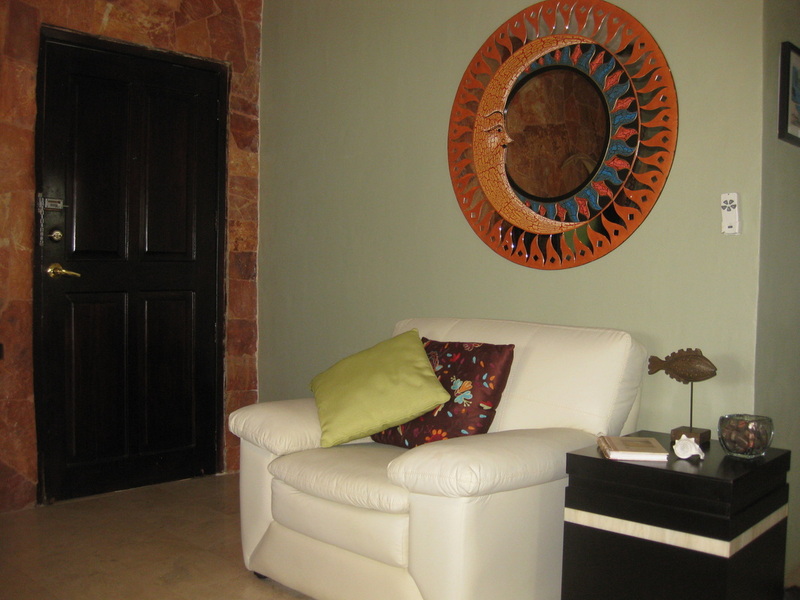 Enjoy your stay at Casa de Sueno! We will be back for a third year in a row in 2014! Remember - limited alcohol sales on Sundays in Mexico! 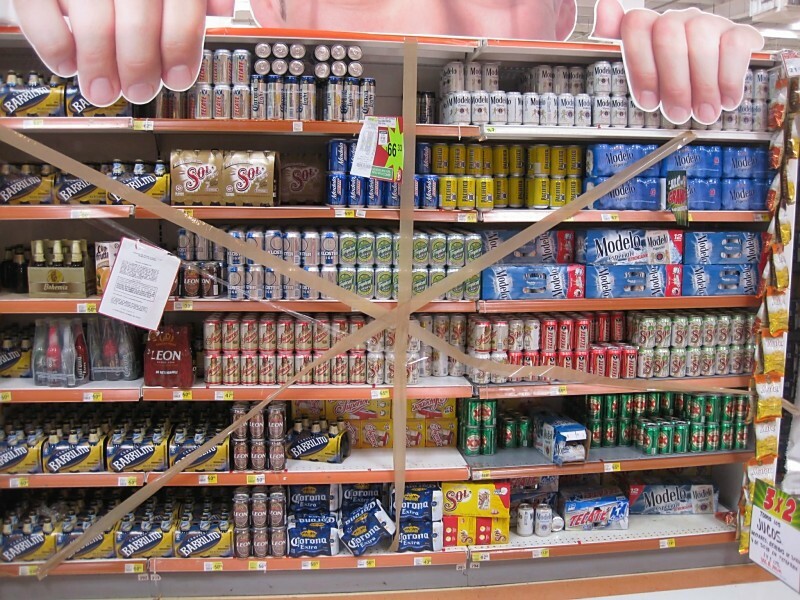 Going to the grocery store can be an entertaining adventure in Mexico! We enjoy exploring the culture through their food – and visiting a grocery store is an excellent start on that journey. 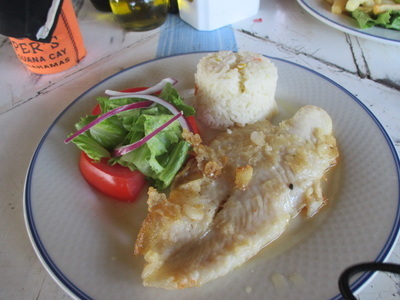 The most obvious “adventure” lies in the different proteins consumed in Mexico – in Playa del Carmen you will see an abundance of seafood that is unusual to find even in a seafood shop back home. Octopus, squid, giant squid and exotic fish are just some of the unusual sights on ice in the seafood section. In the beef and pork section, it gets even more odd – Mexicans, like many other cultures, eat most organs and other parts of the animals that Americans would never consider eating. So this is your chance to gaze upon beef tongue, brains, eyeballs, and anything else that you can think of. Twelve year old boys will especially enjoy this activity! Refrigeration (or the lack thereof) makes for another significant difference. In Mexico, eggs are stored in the aisles and not refrigerated. Obviously, this is OK as it is the only way you will see eggs here. But it makes me wonder what it is about OUR eggs at home that require cold storage? Anyone know? Milk is one of the other things sold off of the shelf – it is sold in boxes off the shelf instead of plastic bottles in refrigerated cases. I have been told that this milk is processed with extremely high heat which somehow results in no refrigeration needed. You can buy boxed milk in the U.S., I have some at home saved for when I run out – great option! Once it is opened, however, even boxed milk needs to be refrigerated. 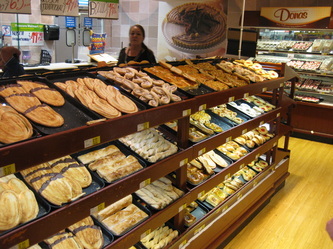 A delightful place in a Mexican supermarket is the fresh bakery! All kinds of pastries and goodies are placed out in the aisles. Grab a pizza tin and a pair of tongs and go through the aisles choosing what you want. When you’re done loading up your tin, take it to the counter where a lady will put it in bags for you and place the price on the bag. Very inexpensive and good. I prefer the ones with sugar or chocolate on them, as Mexican breads and pastries are not as sweet as what we eat in Texas. And don’t forget to spend some time in the produce section. You won’t believe the number of limes displayed!! Along with many other tropical, tasty fruits and vegetables. Pick up something you aren’t familiar with to sample back at the condo. But remember to soak ALL fruits and veggies and greens in the sink with a few disinfectant drops first. And note that produce doesn’t stay fresh long in Mexico, so only buy what you will eat today and tomorrow, then make another trip. Now it's ours - Before and After pictures! Our new home - beautiful but quite plain. 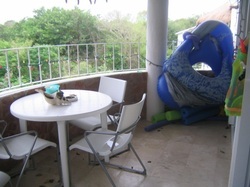 We were able to move into our condo in Playa during October of 2008. We truly loved it, and one of the reasons was because it was move-in ready. But I recently ran across the pictures from that first year and I hardly recognize it as the home we enjoy now! Although we have only been able to spend one week in Playa at a time for now, I am pretty amazed at what we have accomplished during those short vacations. I thought it would be fun to share the highlights of the changes we have made and some of the funny stories that go along with them, complete with “before” pictures – and some "after" pictures at the end. I am especially impressed with what we accomplished as I think back to that first week that we were able to move in and call it ours. Although we purchased the condo furnished, there was nothing other than furniture there plus a small set of pots and pans. So we immediately set out to purchase everyday necessities such as towels and sheets, dinnerware, small kitchen appliances and utensils, things for the walls and décor items. We had brought a few things from home with us, but you can’t pack much in two suitcases. We quickly found WalMart and Sam’s Club to be invaluable, and joined City Club across the highway as well. Lots and lots of shopping! But the bigger to-do’s were to arrange for satellite installation, and purchase outdoor furniture and a washer/dryer. We quickly determined that a gas dryer was much more preferable to an electric one, but gas wasn’t available on that side of the condo. So, through a neighbor we met the day before, we hired someone to run a new gas line from the roof (where our propane tank is stored) down the other side of the building and through the wall into the storage room. By far the biggest hassle was shopping for furniture and the washer/dryer. We discovered after only one night that our plan to make do with the full size bed in the master bedroom was a bad idea (Mark is 6’4” and I am 5’ 8”). It seemed romantic at the time, but that went out the window quickly. We spent several days walking up and down the highway, where many of the town's furniture stores are located. I wish I had worn a pedometer those days - we logged quite a few miles! We finally bought a new king sized mattress and frame at Telebodega, and then went about trying to arrange for delivery, all in our VERY limited Spanish. In Mexico, it is very difficult to find some places with simply an address, and we didn't even know what ours was! So a hand drawn map was our best option to help the delivery men. Yikes! Original balcony furniture - we like our teak set much better! 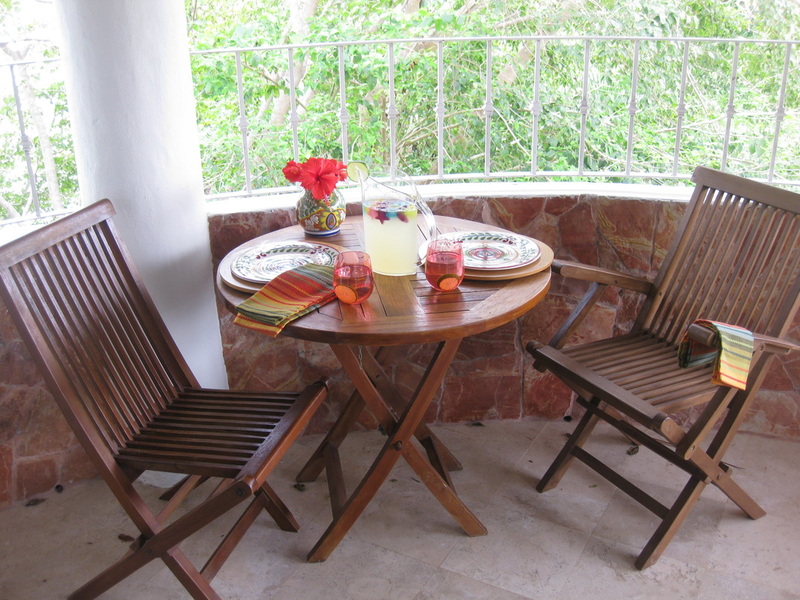 Same was true for our beautiful teak balcony furniture (which we also found on our treks up and down the highway). Amazingly enough, both deliveries made it to the condo, eventually. We had to hang out on our front balconies almost the entire day just watching for the delivery trucks, and then had to rush down the stairs, yelling and screaming with arms in the air, to flag them down when they passed us by. Quite dramatic, I can assure you, since we would be leaving for home in Texas the following day – not much room for error. On our second trip we would purchase the bikes, the BBQ pit, recover the dining room chairs and also bought and hung a new ceiling fan in the den. But by far the funniest thing we did this trip was purchase the large, tall vase that now stands in the corner of the dining room. We found this vase at a store on the highway and loved it immediately. But when we stood on the street with it, we couldn’t get a taxi driver to stop! I guess they didn’t want to try to figure out how to fit it into their cab, it was almost as tall as I am. So, Mark took the vase and hid out of sight around a little corner while I flagged down a taxi. When I got in, Mark came out of his hiding place and loaded the vase across my lap with the other end sticking out the window of the other side. It was pretty hilarious. We tipped the taxi driver well. In October of 2009 we had decided to make some major décor changes. Although I liked the white walls, Mark didn’t. So I took pictures of the condo and met with an interior decorator back home to select a new wall color. We chose a color from Sherman Williams because we had seen one on the highway just outside Playa and hoped that we could get the same color. Once in Playa, we took a taxi to the paint store and asked him to wait while the paint was being mixed for what we needed - one, 5-gallon container of paint. Mark and I were very proud of ourselves, having completed this transaction 100% in Spanish. But that pride was very short lived when I saw them loading FIVE, 5-gallon containers into our taxi! Instead of about $100usd in paint, they had mixed about $500 worth of paint! It was a tense moment to say the least. Let’s just say that we are not welcome back in the Sherman Williams store in Playa. Back at the condo, Mark even stepped into the paint bucket back at the condo, another fun event. But in the end, we love the color and have a great story to tell. New curtains from home finished the new look. What do you think – do you like the color? In 2010 we decided to replace the sectional sofa (which never wanted to stay together) and the matching chair with all new furniture. We kept the same look – cream colored leather – but we bought much higher quality furniture that is so much more comfortable than what we had before. 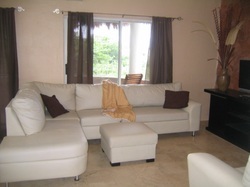 And no more sectionals - two large club chairs plus a sofa give us plenty of space to relax and spread out. I only wish we had done this earlier! Now you can actually nap on the couch without rolling off! And we continue to do other smaller projects. On our last trip Mark installed a peephole so you can look out the front door before opening it, and we bought new comfy cushions for the lounge chairs down at the pool. Now you have options - you can nap indoors or out! Take a look at a few of the "after" pictures below. 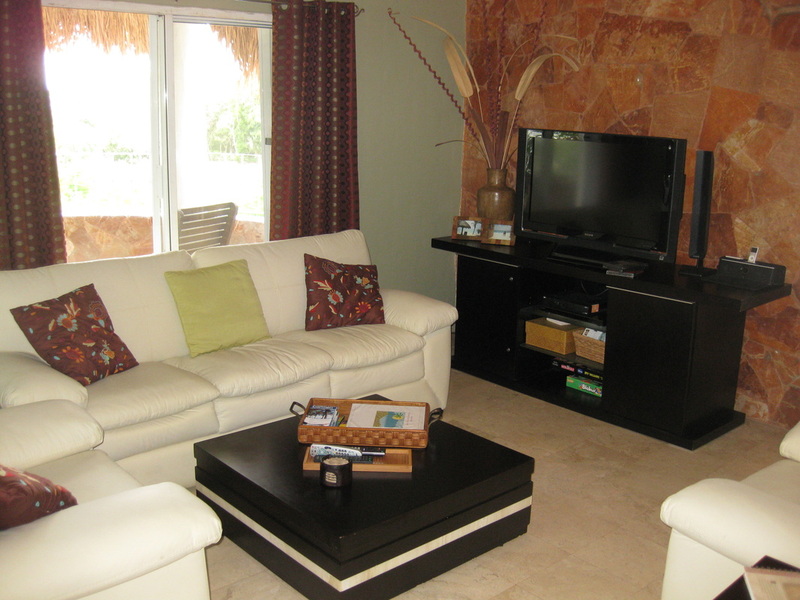 Visit our Condo Pics Photo Gallery to see all of the pictures of our home in Playa. For now, I think we may be finished with major projects, and now we can just relax and enjoy our little piece of paradise. What do you think about our changes? Do you ever do things in a foreign country that you would never do at home? Well, here’s one for you! Although we had never met our new realtor, I had seen his picture on his website. With not much more information than that, we hopped on a plane to Mexico. My mom and I arranged to meet him on the corner of 10th Ave and 10th Street at the appointed time and he would pick us up and take us to see the condo. So here we are, two gringo women, standing on a street corner, peering into white vehicles (every other vehicle in Mexico is white) looking for Rob Kinnon. Sure enough, he pulls over and we hop into a car with a complete stranger who we met on the internet in another country. The funny thing is, it didn’t feel dangerous at the time, it felt fun and exciting. Luckily, things worked out well and he was the “real deal”. Rob took us to the condo, and while my mom flushed the toilets and flipped all the light switches, I stood outside on the balcony watching the most gorgeous tropical birds fly around the garden and knew I was in paradise. The condo itself was (and is) beautiful, but it was the ideal location that made us jump so fast. Walking distance to everything we could ever want, yet also secluded and private on the edge of the gated neighborhood of Playacar. I used Rob’s cell phone to call Mark back home and told him that I was signing a contract – just 3 days after receiving Rob’s original email! Sounds like the end of a perfect story, right? Uh huh. I’m not sure what the total number of mistakes we made during this whole process was, but I can tell you, it’s a big number. Before going any further, I guess I should say that, in spite of everything we went through, we couldn’t be happier now. This transaction started for us in May of 2008 with a sales contract. We assumed we would be closing in just a few months as we were paying cash. Easy-peezy, right? Not so much. In the end, two attorneys later, and many scary moments later, we were able to take possession of the condo in October (4 months later if you are counting), but it would take another 6 months before we would sign the big “Harry Potter book” in the notario’s office making things official. 3. We learned how to dial all kinds of phone numbers to and from Mexico, Canada and the U.S. even when a cell phone is involved. 4. We met some amazing people along the way and learned how to focus on the PERSON and not on their station in life. Ever notice how no one in Mexico asks you what you do for a living? 10. We learned that you have to think really hard before hanging a picture on a wall, since you actually have to drill a hole into concrete to do it. 11. Most of all, we learned how warm and generous most Mexican people are when treated with respect. I’m sure there are many other things we learned, but these are some that stand out from our experience. We love being able to spend so much time in a different culture, challenging many of our old beliefs about the “best way” to do something. Often, we wish we could take the best of our two worlds and combine them. For now, this meets our needs and we are blissfully happy. Let's buy a home in Mexico! In my last entry, I talked about how we came to realize that there was more to life than working for corporate America until we were 65, hoping to squeeze in a few fun years somewhere before heading off into the far blue yonder. Here is the beginning of the tale of how we purchased our little slice of paradise. 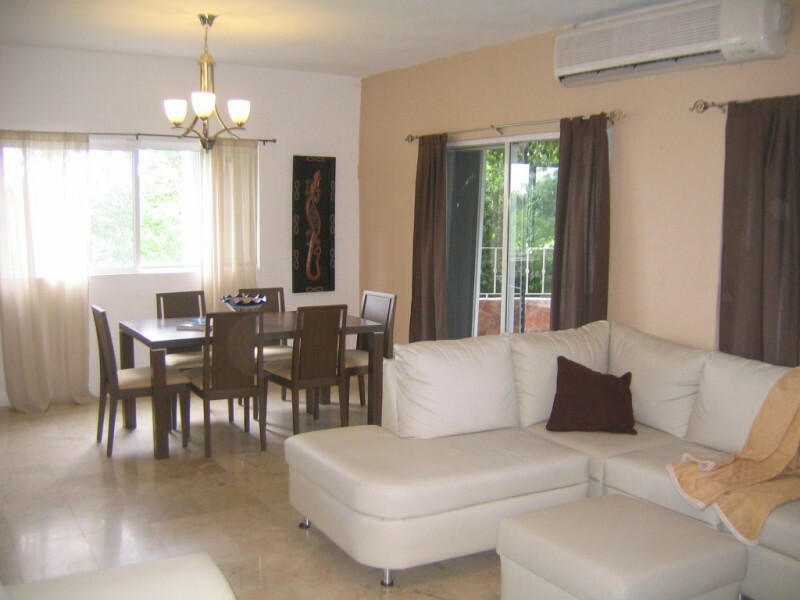 Once we decided that the area surrounding Playa del Carmen was our choice, we then did what everyone does – explore the internet looking at properties for sale! After chatting with a few realtors online, Mark headed to Playa alone to do some looking around. (He always has more vacation time than me). 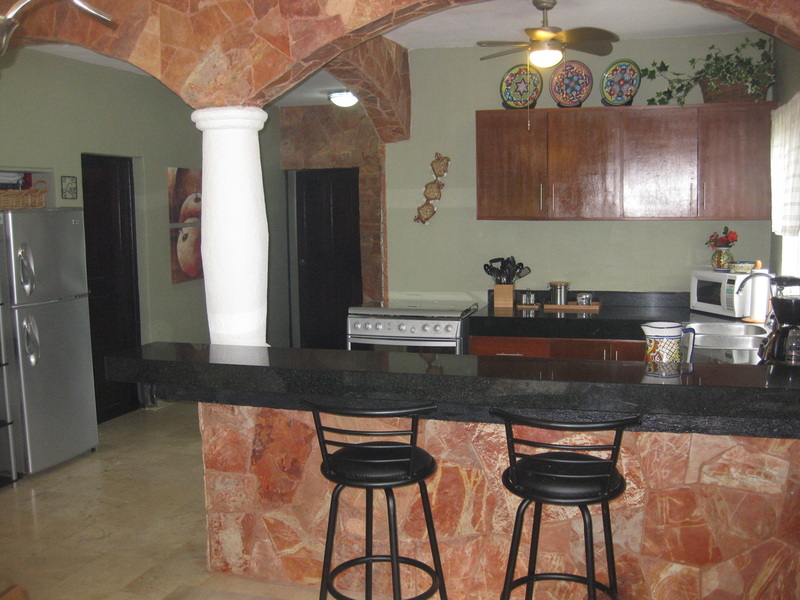 He met with a young realtor and, armed with our checklist of things we knew we wanted, found a lovely condo in the nearby community of Puerto Aventuras. He brought home plenty of pictures and before we knew it we were wiring $5,000 earnest money to a foreign country! But that property was not to be. After searching around online, I found an attorney located in the Austin area who was well versed in real estate transactions in Mexico. After a few emails and a phone conversation, we hired him to represent us in this transaction and forwarded him the sales contract that we had signed. I immediately got a tense email from him stating that he would like to talk to Mark and I on the phone together. This can’t be good. He explained to us that we were purchasing a condo in a complex that had 3 phases, and our unit was in phase 2. No big surprise here, we knew that. However, the contract stated that the seller would not even START the process of transferring ownership/title to the purchasers until the completion of phase 3. So we could be waiting years for ownership of our unit – not to mention the risk that the builder may or may not even complete the project! Really? I don’t think so! He recommended that we terminate the contract and request a refund of our earnest money. Uh huh, I am sure you see where this is going, right? As you might imagine, this was a drama in and of itself – lots of phone calls and emails trying to talk us out of it, then full of promises that the refund had been wired, check was in the mail, today is a bank holiday – yada, yada, yada. But – big surprise coming – NO money! We were pretty sure at this point that we would never see that 5 grand, but we never gave up while we moved on to find another property. Our passion for this project was not diminished. If anything, we were more determined than ever. Fast forward a few months. 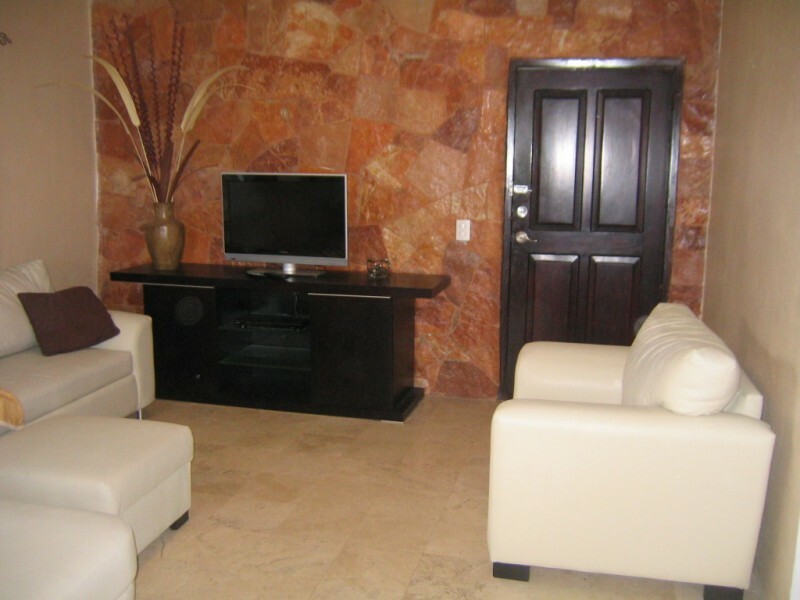 On a normal Thursday night at the end of May, 2008, Mark received an email from another realtor, one that would eventually become our good friend, announcing that he was representing a seller who wished to move to a larger home in Playa. This condo he was selling had everything we were looking for and much more – we got really excited while viewing the pictures and especially when we realized how awesome the location was. I think you could say it was love at first sight! Long story short, I pulled my mother into the adventure, and she and I were on a plane to Mexico two days later. This time, it was Mark who couldn’t take off work on such short notice. Before I tell you about seeing the condo for the first time, I have to tell you about getting our other earnest money back from our first fiasco. After several months of almost daily calls and/or emails, I am now in Playa so I decided that I will just “pop in” and pay an unexpected visit to Veronica (our contact for the builder). My mom and I are walking down 5th Avenue and we see the office of the builder, and a young woman is sitting on a chair out front talking on a cell phone. She sees us as potential customers and sees an opportunity for a sale, and we get her most charming “Hello, how are you?” complete with a huge smile and sparkly eyes. I say to her “I am looking for Veronica” and she tells me that she IS Veronica, still all sparkly. Then I tell her my name and all I can tell you is NO MORE SPARKLY! After about an hour and a half of “I can sit here all day – I’m not going anywhere until I get my money”, the funds were wired and received back home. (Moral of the story – don’t ever give up, just get on a plane). 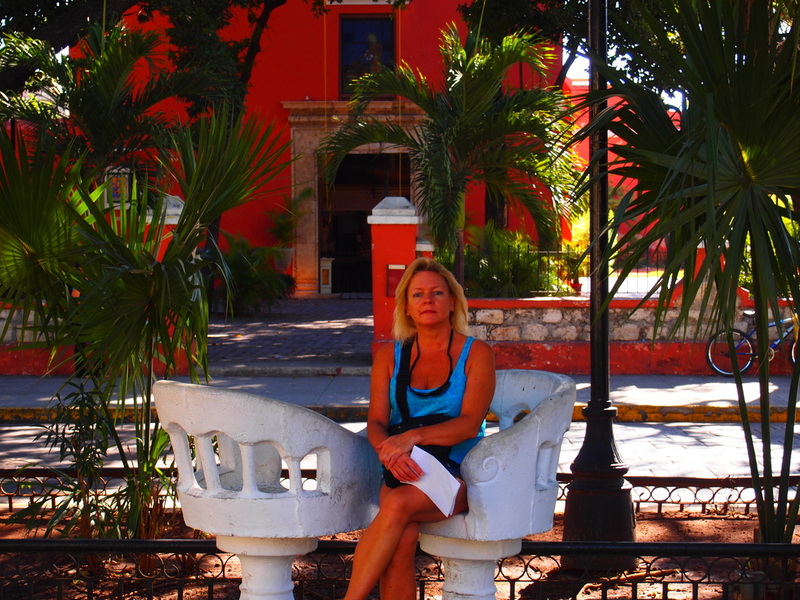 Stay tuned to my next post with more of the “adventure” that is buying property in Mexico! Well, here it is – my first blog post! 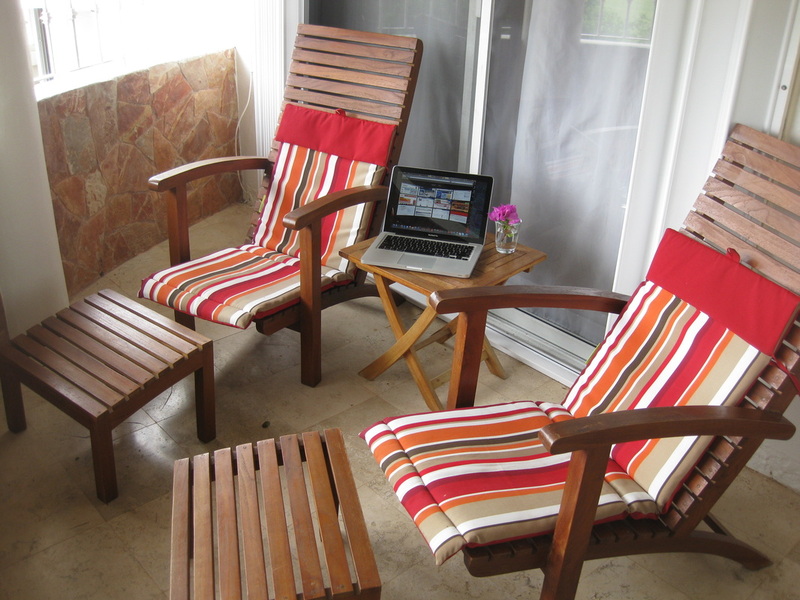 I have had so much fun creating this website for our home in Mexico and our second home town, Playa del Carmen, that I decided to take advantage of the website’s capabilities and write a blog! I get asked questions all the time about our crazy adventure, and I am looking forward to being able to share our opinions and experiences in Mexico as well. Will anyone be interested in reading my posts? Who knows? But I know that I will enjoy being able to record my thoughts and create a small history of our journey to living (well, not yet, but soon) in our beloved Playa. For those who don’t know us, Mark and I had a goal for over 10 years of owning a home in a foreign country, and retiring at a “young” age (exact age yet to be determined). Where did this desire come from? Well, I’ll tell you. We have always loved to travel, especially to tropical locales. About 11 years ago we took a trip that would forever change the way we looked at the world. We went to the Bahamas Island of Exuma and rented a houseboat for the week – this was by far the coolest thing we had ever done! The houseboat could travel the 5 mile by 10 mile calm waters off of Exuma between the main island and many smaller islands that created a barrier to the waves of the Atlantic. We didn’t know at the time that this was a major gathering spot for liveaboard sailboaters whose lifestyles we would find so appealing, and that they would become the catalyst for a major life change for us. 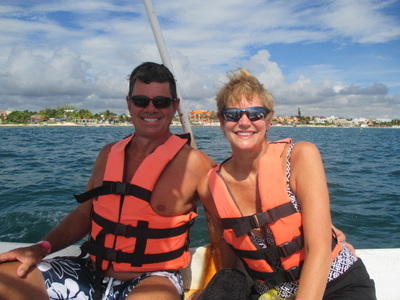 Laurie Ritchel and her husband, Mark, purchased their dream vacation/eventual retirement home in Playa del Carmen, Mexico in October of 2008. But her love affair with Mexico has been going on for many more years. Laurie currently lives in Texas where she is employed as a fundraiser for Lamar University.